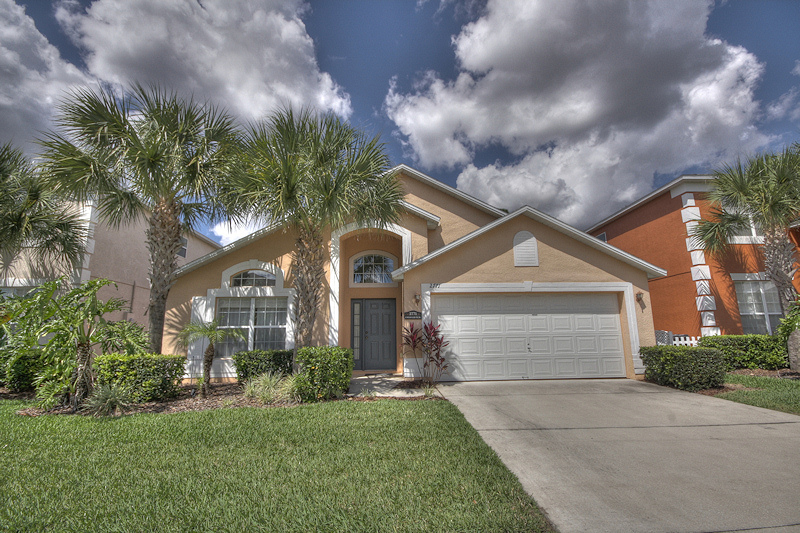 This home at Emerald Island is furnished to a high standard with 5 bedrooms and 3 bathrooms. The living accommodation is light and spacious throughout. 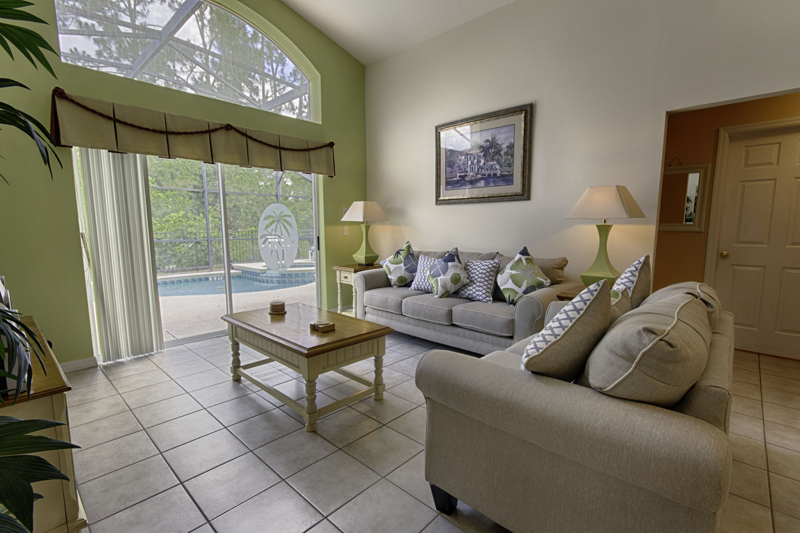 The heated pool and spa back onto lush tropical woodland with ample poolside furniture and is ideal for a quiet evening to relax and unwind at the end of a busy day exploring Central Florida. 5 minutes from Orlando's famous attractions Emerald island is just far enough away to feel like your own tropical hideaway. All the excitement of Walt Disney World, Seaworld, Universal and Busch Gardens are just a short drive away - not to mention the great Golf, Shopping and Dining. 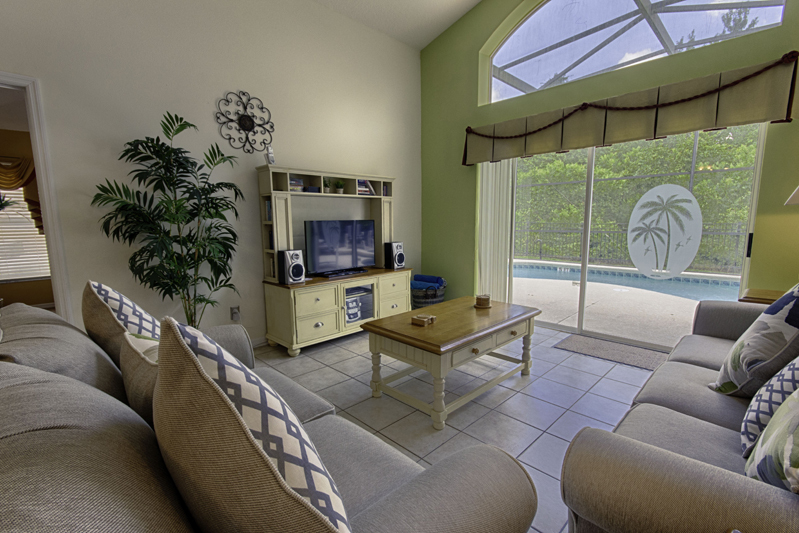 A spacious open plan Family Room overlooking the Pool area, this room has ample comfortable seating. It has a large screen TV with numerous cable channels, DVD player, Music Centre, and a Playstation 2. There is a selection of DVDs, CDs, Books and popular Board Games for your further enjoyment. Broadband internet access is also provided. The large Kitchen is open plan with a breakfast table and 4 chairs, fully fitted with Microwave, Dishwasher, Coffee Maker etc, in fact everything you are likely to need. For peace of mind there is a Fire Extinguisher and a First Aid Kit. 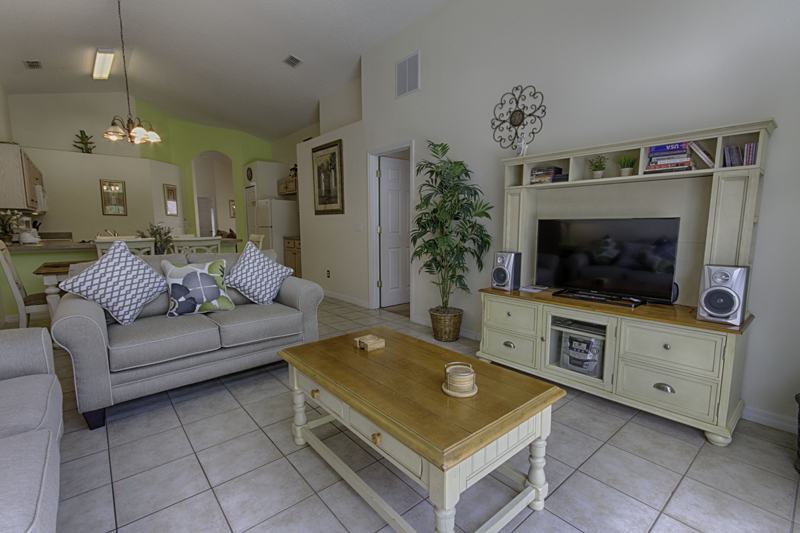 The tastefully decorated Master Suite overlooks the pool and has a Queen Bed with 2 Nightstands, Lamps, a large Dresser with Mirror, TV/DVD player, Hairdryer and Alarm Clock. The walk-in Wardrobes have ample hanging space. The large en-Suite Bathroom has a walk-in shower, WC & Vanity Unit and a large corner bath. There are 2 further Queen rooms, each have 2 nightstands with lamps and ample hanging space in the fitted wardrobes, both have Alarm Clocks and Hairdryers. They also have TVs. These 2 rooms share a Jack and Jill Bathroom which has a step-in Bath with overhead Shower, WC and Vanity unit. The 2 Twin-bedded rooms each have a night stand with lamp and fitted wardrobes, they share the 3rd bathroom with its step-in bath and Overhead Shower, WC and vanity Unit. The Heated Pool and spa back onto lovely woodland and are enclosed by the unique Florida netting which keeps the insects at bay and allows the sun to penetrate freely during the day. There are four sun loungers, a table and four chairs around the pool. The spa has the added advantage of a rapid heat facility for those evenings when a soak in the hot tub would round off the day perfectly. Pool toys are also provided, as well as a childs life vest. ***NEW FOR 2019**** Cinema Room. 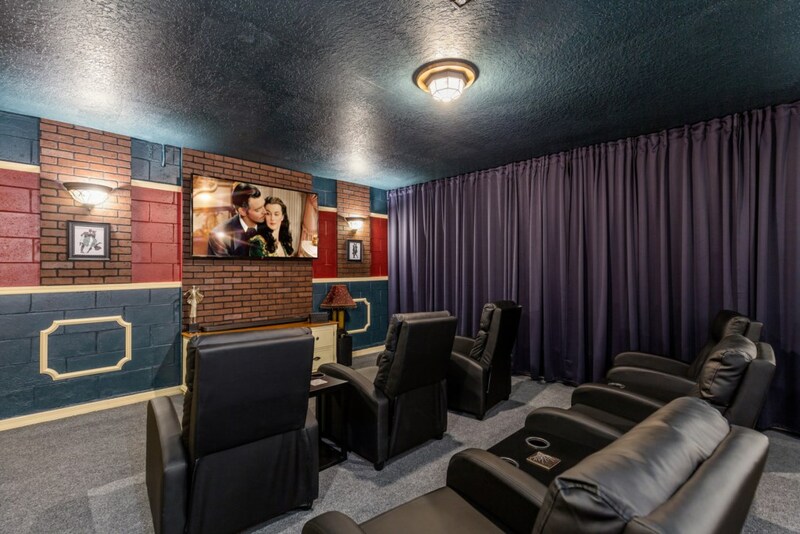 This brand new addition takes movie night at home to a whole new level. Watch your favorite movie or program whilst relaxing in the cinema style reclining chairs with a cool drink and some popcorn! 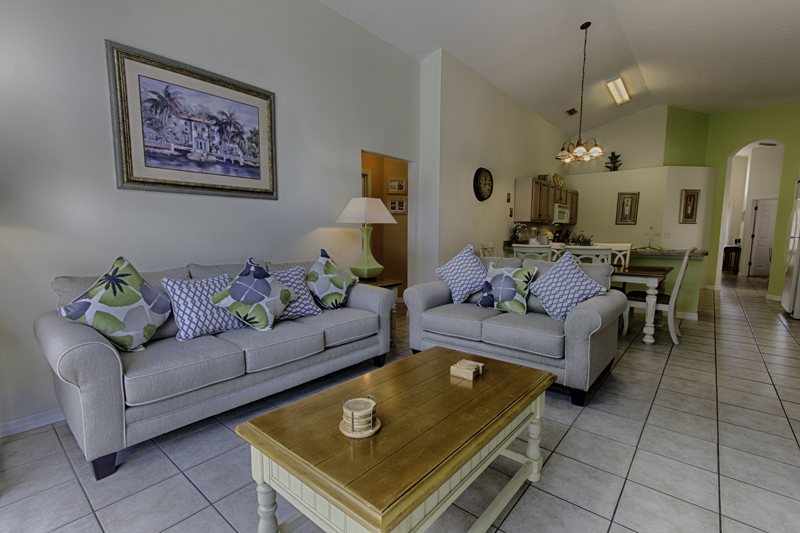 The villa is situated in a quiet location on the prestigious Emerald Island resort, a gated community in a beautiful setting and surrounded by water. The villa is only minutes away from the popular 192 highway with it's many shops, restaurants and attractions and within easy reach of all major highways for those trips further afield. The Disney complex is just a five minute drive away. For those who need to keep in touch we now have a broadband internet connection available.